Posted on Wed, May 9, 2012 : 11:01 a.m.
Thomas Zurbuchen envisions a world where the risky ideas have a greater chance. 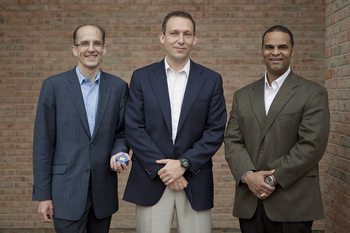 The associate dean of the University of Michigan College of Engineering, along with two of his colleagues, is helping launch a $15 million research initiative that encourages collaboration among disciplines and allows professors —and not third-party government or industry groups— to decide which projects receive funding. Mark Burns, Thomas Zurbuchen and Alec Gallimore together camp up with the idea for MCubed. The MCubed initiative will award up to 250 university-generated grants worth $60,000 to three researchers from different disciplines who agree to work together on an idea. The premise of the program, Zurbuchen says, is to encourage ideas that might not obtain funding at all or in a timely manner due to their riskiness. "The type of problem that MCubed will be ideal for is kind of a high risk, totally and utterly new, clean-sheet-of-paper problem, where the only way to make progress is to have somebody really working on it," he said. "Innovation really occurs in an environment where people take risks and talk about it." Using the MCubed platform, researchers can propose ideas or choose to participate in an already conceptualized idea. A proposal can't get off the ground unless it has three faculty commitments, thus the initiative puts university professors in charge of divvying research dollars in the form of peer review. As a consequence, the three like-minded researchers avoid the traditional year-long government grant review process and engage in research without outside constraints. Once three researchers choose to work together they're considered a 'cube' and can use the $60,000 award to hire a graduate student or postdoctoral researcher for the project. According to U-M, projects can grow, cube by cube. For example, if 30 faculty members coalesce around one idea, for example, they could open a new large-scale research center with 10 funded positions overnight. "You can really create a sizable, immediate program," Zurbuchen said. The program, which U-M predicts is the first of its kind, is limited, Zurbuchen added. "MCubed is not going to solve every funding rogram that researchers face," he said, explaining the program is limited to funding personnel and not facilities or equipment. The hope is that the U-M can take "the home runs," or successful projects generated by MCubed, and further develop them using outside resources. At the end of MCubed's first year the school will hold an innovation symposium to highlight research achievements generated as part of the program. U-M's provost's office is funding $5 million of the initiative and U-M's 19 schools and colleges will fund the remaining $10 million, depending on the disciplines involved in research. U-M anticipates the program will fund roughly 250 projects in its first two years. With such a large number of projects, Zurbuchen acknowledges that "not everything we’ll be doing will be totally successful." "That's just the way research works," he said. "This is a risky program. Even the projects that will be successful will have on their way some failures." Nonetheless, U-M believes the program is a way to break new ground that might otherwise remain unexplored. The program is part of the $50 million Third Century Initiative encouraging interdisciplinary collaboration in an effort to solve global, real-world challenges. The initiative, announced by U-M President Mary Sue Coleman in October, will include additional yet-to-be-announced programs. Thu, May 10, 2012 : 3:13 p.m. Fantastic idea! The universities create huge opportunities, then have to seek out external venture capitalists who reap all of the rewards. This has the potential to become a self funding model that lowers the cost of education for all students. There is no reason to continue the vast &quot;give away&quot; program that comes from taxpayer funded basic research. Wed, May 9, 2012 : 11:56 p.m.
Nice idea. I think it might be better to do twenty-five $600,000 grants instead. I think you'd see a lot more competition for the grants. Wed, May 9, 2012 : 11:50 p.m. The concept of encouraging faculty to employ a student or postdoctoral for one year on a risky project makes it sound like the University considers these trainees expendable: somehow not my idea of a valuable educational experience. the University may benefit financially, but benefits from the standpoint of its teaching mission seem less assured. Thu, May 10, 2012 : 9:37 a.m.
God forbid that young entrepreneurs ever take risks as a learning experience. Wed, May 9, 2012 : 8:07 p.m.
Congratulations to Dr. Zurbuchen! He has done an amazing job driving the entrepreneurial culture through innovative programs such as 1000 Pitches, the Center for Entrepreneurship, and other efforts. In addition, he has a stellar record in helping to generate funding (much of it from external sources) for these efforts. Good for the UM to be supporting this initiative. I'm sure a number of great ideas will see funding, and spawn innovation through it. Wed, May 9, 2012 : 5:59 p.m. It is fine to say that $5 million will come from the Provost's office and $10 million will come from the colleges but that means nothing unless you say what revenue source it comes from. Is it money from grant overhead, is it money from tuition, is it money from the general fund. How else can you tell whether it is being paid for by student tuition or state appropriations. This is the kind of obscure accounting that lets the University administration fund things as if money grew on trees. Wed, May 9, 2012 : 5:16 p.m. This is an interesting idea. I really like the idea of research dollars coming from internal university departments and not &quot;steering&quot; dollars from outside sources. A little bit closer to unpolluted science!